Appendicitis is an emergency – get to a hospital right away! Talk to your health care provider BEFORE taking any medicine. Appendicitis, pronounced “a-pen-di-sigh-tis,” is the inflammation of the appendix which is a tube-shaped organ that is about the size of your index finger. It is located in the lower right side of your abdomen (belly). Appendicitis is a serious condition that requires immediate care and treatment by a doctor. Inside the appendix is a tube-shaped piece of tissue that opens up into the large intestine. If this tube becomes blocked or infected, the appendix will become inflamed and appendicitis will occur. 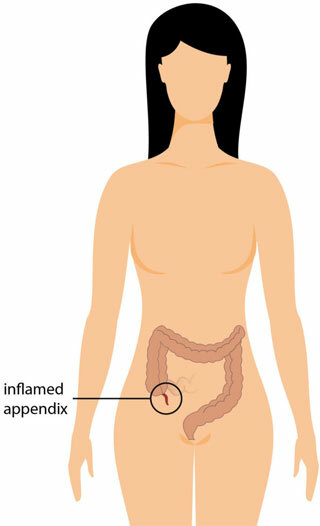 The inflammation and swelling causes less blood flow to the appendix which then causes the appendix to die. Bacteria (germs) then multiply and start to attack the appendix. If the appendix isn’t removed, it’s possible that it may burst, which can cause a life-threatening condition. That’s why early treatment is very important. What are the most common symptoms of appendicitis? If you’re having bad pain in your lower belly, it’s important to contact your health care provider right away so he/she can figure out what’s wrong. If you have appendicitis, you’ll need treatment as soon as possible. What is the test for appendicitis? There isn’t a special test just for appendicitis, but your health care provider will likely be able to tell if you have it by asking you questions, examining you and pressing your belly, testing your blood, ruling out other possible conditions, and in some cases, scheduling you for an ultrasound or CT scan. If your health care provider thinks you have appendicitis, most teens will need to have their appendix removed as soon as possible. Surgery is done right away to make sure that the appendix doesn’t rupture or burst and cause the infection to spread to other areas of the abdomen. The name for the operation is called an “appendectomy,” pronounced: app-en-dec-toe-me. There are some research studies in which antibiotics are given for early appendicitis but the symptoms often come back in the next year. What happens if I have to get my appendix removed? Your nurse or doctor will explain what will happen. You should also ask questions so you know what to expect. You will be given anesthesia, which is a special medicine that will put you into a deep sleep and prevent you from feeling any pain during the operation. When you are asleep, your doctor will make a small incision in your belly and remove your appendix. Once your appendix is removed, your doctor will stitch the skin back together. Some stitches will need to be removed in about a week and other stitches dissolve on their own. After your appendectomy, you’ll have to stay in the hospital, but the length of time depends on whether your appendix burst or not. If you don’t have any complications, you’ll likely just need to stay in the hospital overnight. If your appendix burst or if you have a fever, you will need to stay in the hospital a little longer. Your doctor will give you a follow-up appointment so he/she can check to make sure you are healing well. It is very important to keep this appointment. Will I be ok without an appendix? Yes. Your doctor will explain what you can and cannot do while you are recovering from your appendectomy. You’ll need to be excused from gym class, sports, and very physical activities while you are healing (about 2-4 weeks after your surgery) but you will be fine because you can definitely live without an appendix. There can be other causes of severe belly pain so it is important to be honest with your provider and explain when the pain started, how long it lasts, if you have had a recent injury or taken new medicine for any reason, if you are sexually active, and what medicines and over-the-counter herbs and pills you take.